As we move into Spring, we put away our heavy sweaters and puffy jackets (maybe) and pull on our favorite baseball team’s t-shirt & get outside for a breath of fresh spring air and listen to the wonderful sound of birds singing in the trees. If we update ourselves for the new season, what can we do to roll our marketed home over as well? You don’t want your home to scream, “I’ve been on the market since Christmas (or worse yet fall)” so follow these few steps to reap new blooms of activity toward your home being sold! Remove all your dead tree branches and lingering winter greens and replace them with containers filled with spring flowers that will continue into summer. using the containers to add bursts of spring color until your perennials start popping will give you early season curb appeal. Replace your winter-ish plaques, wind chimes, doormats, flags and other exterior decor with spring focused items. Don’t break your bank buying ‘special’ spring decor. Use potted tulips, daffodils and other spring beauties to create charming, attractive ‘curb appeal’ near your home’s entryway. For showings around the holiday add some cute Easter items. Be minimal but deliberate. When showing your home, light a couple of fresh spring scented candles or use fragrance plug-ins. It’s been proven that the seasonal scents are very inviting, calming and creates positive sensory reactions. Nothing feels like home than the smell of spring blooming through ‘finally’ open windows. If you are planning to have cookies out for an open house, make them light sugar cookies with spring colored frosting. 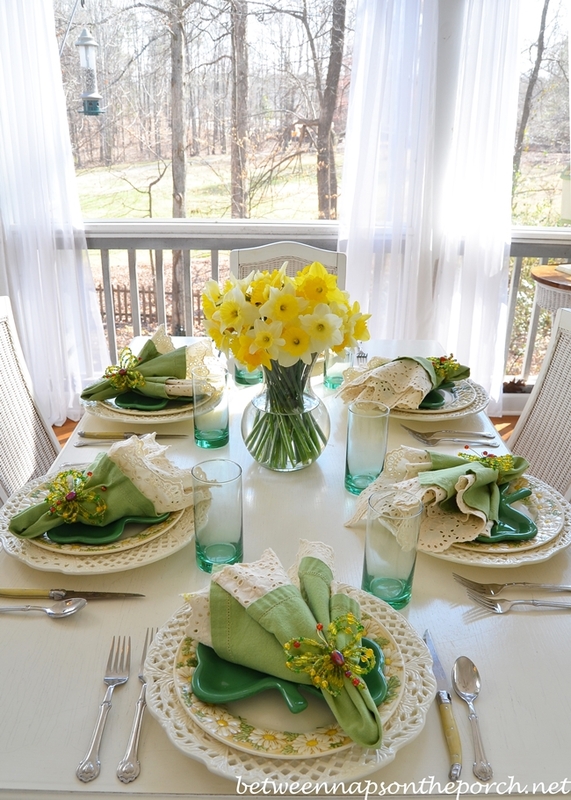 Fresh tulips in a vase and spring colored placemats, napkins, tablecloths (if you display your Dining Room with a set table….always a nice touch!) and lighter clear wine glasses if they are on your set table. Eliminate all the heaviness of winter decor with the light bright feeling of new life that only comes with spring! Again, don’t break the bank just to change the season. Use simple, colorful decor (great items ie: vases, napkins, napkin rings, etc. can actually be found at the Dollar Tree!). Buy your flowers at the grocery store. Many offer 3 bouquets for $10-12. That allows you to spread the beauty around your home. Think before you spend and then open your windows, catch a sweet breeze and spring into Sold! « You Can Find Your Happily Ever After Home! » ASSISTANCE TO VETERANS W/HOME OWNERSHIP/RENTAL!